Generation of solar fuel means using energy from the sun and storing it in a chemical form to make a new chemical which will release energy on demand. There is no commercially available solar fuel as yet, but given the amount of research effort going on, we can expect to have cost effective solar fuels soon. Based on theoretical reasoning, two types of solar fuels are now being considered. Those based on water (hydrogen), and those based on carbon. One of the reasons is that both are abundantly available in nature. Hydrogen as a fuel would have the special advantage that its consumption in either a fuel cell or direct combustion will give out energy while producing nothing but water. Thus, it will have a zero Greenhouse Gas (GHG) footprint. Fuel cells using hydrogen can operate at low temperatures, and hence, hydrogen is attractive as a fuel for these cells. Already automobiles have been tested which will run on hydrogen and produce power releasing nothing to the atmosphere but water. On the other hand, Carbon based fuels will naturally result in production of carbon dioxide and will have a non-zero GHG effect. Problems associated with hydrogen as a fuel are difficulties in production and storage. Costly electrolytic catalysts made from rare earths are. Hydrogen has a high energy density of 39.5 kWh/kg which is much more than the per Kg energy of any other fuel. However, being the lightest of all elements it occupies a very large volume in the gaseous state. Liquefication is costly and it has to be stored in high pressure tanks. Thus, on a per liter basis it can yield only 2.8 KWh per liter. That is 3.5 times lower than the energy density available from gasoline. An attractive option would be utilization without storage. That means generation on site where it is to be used. Automobiles are being developed which will generate their own hydrogen and use it for fuel using fuel cells. If onsite generation can be done on a small scale, and on demand, and fuel cells become commonly available, an excellent application would for use in homes. Not only would we have clean energy for cooking and warming (even cooling), the oxygen released from electrolysis of water would benefit the environment. A controlled amount could even be routed to the ventilation and air conditioning system for a much healthier air. Water is a very simple compound of oxygen and hydrogen. Any high school student would know that hydrogen can be produced by electrolysis of water, that is, by passing direct current through water. Apparently, it is as simple as connecting two wires and a source of dc voltage. Textbooks also tell us that 1.23 volts DC are required to break water into hydrogen and oxygen. And a photovoltaic solar cell can easily provide that. But when practicalities are considered, it is not that simple. Actually, there is something called ‘overpotential’, or extra voltage required to cause reasonable electrolysis. Process efficiency is of the order of 10%. Simple electrolysis is used for industrial production of hydrogen and does not guarantee pure hydrogen. There are multiple problems associated with generation of hydrogen, and multiple techniques are being tried. One favorite technique being investigated is direct photoelectrolysis. That means combining PV conversion and electrolysis in a single unit. This has chances of giving higher efficiencies at a lesser cost. This is another example of how we gain from mimicking nature. A photo electrode absorbs photons to generate electron-hole pairs. The electrons and holes are separated by fields generated internally. 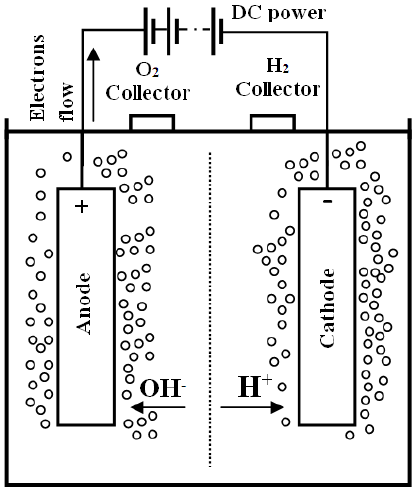 The electrons reduce the hydrogen ions to form hydrogen gas at the photocathode while the holes oxidize the oxygen ions to form free oxygen at the photoanode. The maximum theoretical efficiency of this direct process for conversion from photon to hydrogen is limited to about 30%. Practical achievement lags far behind. The ‘artificial leaf’ created by Nocera in 2012, employing a triple junction PV cell and costly catalysts achieved an efficiency of 2.5%. The photocathode used the alloy NiMoZn to catalyse (promote by presence) hydrogen release while the photoanode used a cobalt-Phosphate cluster (Co-OEC). The main limitation in generating hydrogen from water has been the need for catalysts which are costly, and degrade fast due to chemical corrosion. However, new research is reporting catalysts which can be made from much cheaper and more abundant materials like iron. The day is not very far when households will use fuel cells with onsite generation of hydrogen fuel from tap water, and automobile tanks will carry water. What will the gas station owners do? Find another business!